Hello and welcome to my blog!! We are having our first ever ScrapbookPal Design Team Blog Hop. If you have just happened to arrive by chance and not with the blog hop, go to the ScrapbookPal blog to start at the beginning and join us this weekend while the design team shares some projects and a little about ourselves, as well as a chance for you to win a wonderful prize. My name is Amy and I love to scrapbook, make cards, and altered items. I have been paper crafting for about 8 years. I enjoy blogging about my paper crafting and I am so happy to have the friends that I have made in the blogging/scrapbooking community. When I first started shopping online for scrapbooking supplies, I came upon a website called ScrapbookPal and placed an order. My order came so fast, I didn't hesitate to order again and many times after that. I love shopping at ScrapbookPal because I always get speedy and friendly service as well as great prices and free shipping on all of my orders over $25. I am so honored to be a part of their first design team. Cardstock, border punch: Stampin' Up! I found this 6 inch by 8 inch shadow box frame at Michaels. 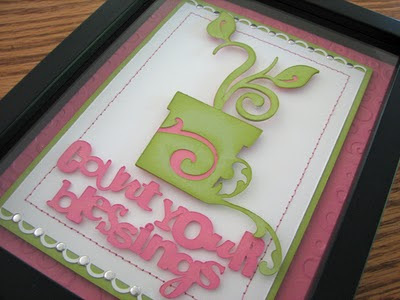 I used my Cuttlebug and Spots and Dots embossing folder to emboss the pink background cardstock. I cut, inked with Colorbox Fluid Chalk Cat's Eye ink pad, and layered the images and sentiment from the Wall Decor and More cartridge. I adhered these with dimensional adhesive to the white piece of cardstock that was punched, glam rock set, and sewn together with the green cardstock. I then put it all on top of the pink embossed cardstock with dimensional adhesive. The blog hop goes from today, August 20th until midnight on Monday, August 23rd. Did you know that at the end of the hop, there will be a winner randomly chosen to win an INSTOCK Cricut cartridge of the winners choice from ScrapbookPal? I would love for one of my blog followers to win, so go on over to the ScrapbookPal blog to get all the details and start hopping. I would love it if you wanted to follow along on my blog, but it is not a requirement to win the prize at the end. Thanks for visiting!! Amy, I love the colors you used on the frame. It came out very beautiful! This is sooo cute! I am going to have to make one of these for my craft room! This is an AWESOME picture frame. It speaks volumes and would be something that I would put up in my home. TFS. What a great project! I love journals. Guess I'll have to bump Wall decor up on my Gotta have It list! I'm now following you...Check out my blog at http://karelj.blogspot.com and vote for Crystal's entry! Amy, this is beautiful! I count my blessings each and every day! Have a wonderful Friday! This is really pretty! I love the popped effect. Wow - this is a precious project - thank you for the inspiration! Beautiful project! It'll look beautiful hanging on any wall! What a beautiful and inspirational project! Great Tutorial. I'm going to have to get this cart. It looks fab. Thanks for the tutorial. Thanks for sharing this project - your whole blog is great! What a pretty frame! I'm getting so many wonderful ideas today. OMG! This is so cute! I love it! very cute! love this framed art. What a lovely ideal. It would look so nice hanging in my kitchen. Thanks for the beautiful project. I love this idea. I have some frames I need to use. I think I might take the dust off and do a few like this! Super cute idea!!! I really love the colors. Love your color choices. Thanks for sharing. What a great idea love those colors!!! Very nice, just may need to get this cart. What a beautiful idea Amy! Thanks for sharing! What an adorable project! I need to try something like this! I am totally loving this! You ladies are making me Wall Decor so much! Great job on this altered project! I really love the color scheme! Great blog hop!! Great inspiration! Ohh I love this, one of these would be a perfect gift for those relatives that have everything! Congrats on the first BlogHop! Amy I already follow your blog. This is my favorite so far on the blog hop. I love this altered frame. Thank you for a chance to win a cart. Your blog is great! Beautiful! I love the colors you used, the bling, and the borders! I love your frame! So cute! This is stunning! Great project Amy! What a great project. I may have to get this cartridge. So pretty...this would make a great gift! Love the pink & green color combo. Please tell me how you embossed that paper with Spots & Dots...it looks to big for the folder!! TFS from another 'scrapping mom'! This is a fabulous project! thanks for sharing it. Love your "Count your Blessings" picture. You did an awesome job on all your creations on your blog. Love those little pinwheels on your summer card and layout. TFS. I LOVE that picture. I want to make one of those! what a great thing to see each day! I have been wanting to decorate my scrap room. This is a cool idea! I may have to use this as inspiration. I'm here on the blog hop. I love your project. Great colors. CUTE CUTE CUTE! I love your project for the blog hop! Very nice! I love the choice of colors. Thanks for sharing! 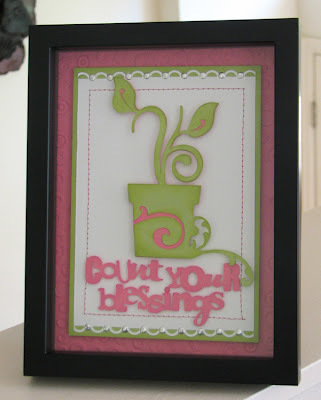 nice bloghop so far, love your color arrangement and the shadowbox is an excellent choice for your project. thanks for a change to win. How creative!! I LOVE it, I am being inspired to create~! Great project! I already have your blog bookmarked and check back regularly. Thanks for the inspiration! What a beautiful project! I love it - and especially love the colors! I don't have this cartridge but will have to take another look at it. Thanks for sharing. Great card. i enjoy your blog and think the blog hop is a great idea! Your work is beautiful. Love this blog hopping! I love this project! I need to try to make something like this. Thanks for sharing! This is so nice!! I just got the Wall Decor and More cart and it is great. Amy, I am new to your blog and I really like your work. I signed up to get your emails and follow you. This is such a cute decoration and I love how you shaded the card for Saturday. This is so cute! !1 It makes the perfect gift for granmathers day!!! I love this frame. I also love this cartridge. Thanks for sharing. What an awesome opportunity - thanks for the inspiration from your blog and the chance to win! What a cute idea! Thank you for sharing! Great color choices! Wow! I love your project. How cute. CUTE, CUTE, CUTE -- what a great gift idea. Love IT! Beautiful project! I love the colors and the design is adorable! Really like your work. Doing the blog hop. Very cute! I love Blog Hops! Now if I could just get off the computer and scrap! Love love love this wall art you have created. TFS...Very inspired by your creation... will put this on my to do project list. I love love love this idea! So cute! Very cute project. TFS and for the chance in this blog hop!